123Landlord Development Blog | Where Are My Accounting Entries? Where Are My Accounting Entries? When you first set up your 123Landlord account, there aren't any account codes added to the account, so the system doesn't assign any accounting entries to incoming payments. You can add a standard set of account codes by clicking the blue button, or you can add your own custom ones. 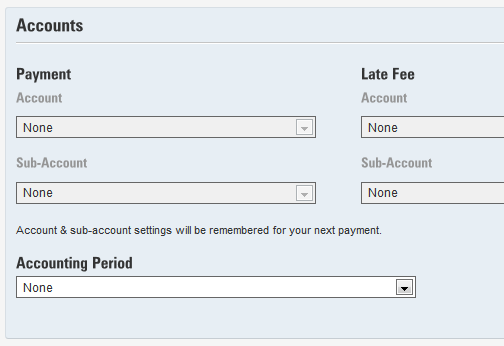 Payment and Late Fee accounts assigned to "None". This means that no accounting entries will be created for these payments. 1. 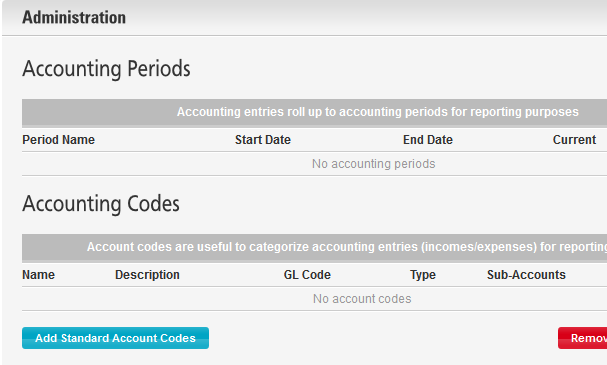 Add a standard set of account codes in Admin --> Accounting tab. Save the payment - and an accounting entry should be saved as well (income entry). "Accounting entry to be filed under: Rent Income"
If you're collecting non-rental payments, or any payments that you want applied to a different accounting code, use the Payments --> Collect Payment method, scroll down and manually specify the accounts you want the payments to go to. Accounting entries will be created appropriately.